In this extremely explicit follow-up to ENTRAILS OF A VIRGIN, a doctor gets more than she bargained for after getting entangled with an evil Japanese Yakuza clan. A woman commits suicide at a clinic after being brutally raped and injected with a drug called ‚ Angel Rain‚ by the Yakuza. A young psychologist infiltrates the clan to avenge her senseless death and manipulates them‚ enacting her own brand of violent justice. Unfortunately, the Yakuza finally catch her too, and her fate brings gruesome death and destruction to everyone involved. 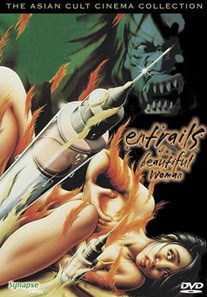 Yet another gory Japanese classic from director Gaira, ENTRAILS OF A BEAUTIFUL WOMAN is a film definitely not for the squeamish. If you thought ENTRAILS OF A VIRGIN was over-the-top, wait until you see what surprises ENTRAILS OF A BEAUTIFUL WOMAN has in store! Not Rated 1986 Approx. 68 min.